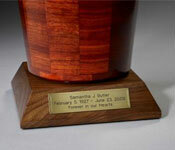 Our most popular design, this earthy cremation urn shows off the natural beauty of wood. 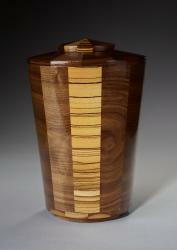 To make this artistic urn, Steve Shannon pieces together segments of black walnut wood. After hand turning the urn and applying a urethane protective glaze, the end result is a rustic and beautiful piece that will serve as a powerful celebration of life for your loved one. 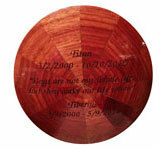 Available in keepsake, small, and large sizes, the Wisdom wood urn can be used for pet friends, children, and adults. Urn jewelry available at Etsy Charmed Wife Shop. Words cannot express how pleased I was with the craftsmanship and quality of this urn. Anna in Customer Service went out of her way to make sure the engraving was complete and that the urn was received in time for my husband's service. It was during the holiday season and delivery was tight. Everyone commented on the beauty and simplicity of the urn. My husband was an artist and photographer and lover of fine craft and I know this is the urn he would have chosen as his resting place for now. Thank you so much. 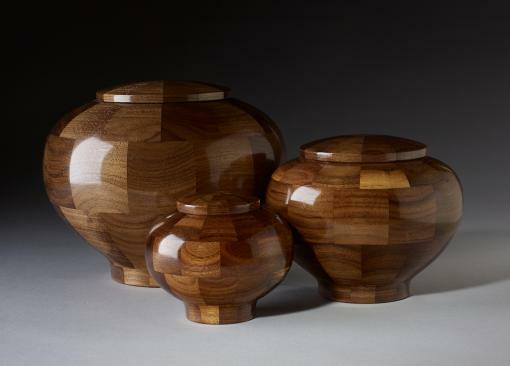 We have purchased two Wisdom Urns, and love the craftsmanship and quality of the woods and finish, and the personal message we could include in addition to the names and dates. The service was excellent, respectful, and delivered in a short time without any hassles or delays. We highly recommend Wisdom Urns - no need to spend time looking further.